I love to shop. For me, the best part about shopping is the hunt. I love that feeling when you find something that you know is just p-e-r-f-e-c-t. One of my favorite things to do when I travel is to wander boutiques in new cities, finding treasures, and chatting with the owners. Over the past few years, I’ve developed a love for online shopping because of the convenience and the breadth of options. I love discovering online shopping sites I’ve not yet heard about. I have a bookmark folder of over 200 shopping sites (and counting). Online shopping is great for directed and comparison shopping — when you know exactly what you want. For example, if you’re looking for an espresso maker, you can probably find one in 3 minutes (and if you’re like me, send another 45 comparing them!). But, if you don’t know exactly what you’re looking for and more in a browsing mood, it’s hard to duplicate that experience online. In the past, the main way that I discovered products and new shopping websites would be through bloggers or friends. But, there are many start ups who are aiming to create the equivalent of an online mall, marketplaces or bazaars if you will, that provide a better platform for product discover and browsing. When I worked at Keep.com (here’s my profile), one of the key problems we were addressing was precisely that of discoverability when it comes to online shopping. My nightly ritual of watching House Hunters International was quickly replaced with seeing what was new on Pinterest. However, far too often than not, I could not find where to buy something I found on Pinterest. Pinterest helped me discover great ideas. But, when it came to products, I was left to hunt on my own for where to buy that sweater I saw a girl wearing or pillow I saw in a beautifully styled living room. For someone who loves shopping, this is the ultimate frustration! Companies in the social commerce or social shopping space all have a common strategy — allow users to curate products on and sometimes off their websites through browser based buttons that will grab an image, very much like how the Pinterest button works. It makes sense, I’m more likely to buy a product that 5 of my friends also liked or that is trending on the site. I agree with both Alvarez and Hiroshi. The experience of online shopping could definitely be improved by focusing more on discoverability. I also agree that discoverability is supported well by community – by letting anyone be a curator. But, I think that one important piece of the equation is missing. Shopping isn’t just about discovering new products through friends or other users on a website. My purchase decision isn’t solely influenced by recommendations of friends. Community is important. But, what about context? When I’m shopping with my girlfriends, we don’t just encourage each other to get items we think flatter each other. We also play stylist. We tell each other how we could wear (or use) a product. Once I was shopping with friends and I pulled a mint colored silk dress from a display. One of my friends said “I would never have picked that.” To which I enthusiastically said “but it will look so good with gold accessories and a pink lipstick! !” I created context, a picture, a story … and then my friend approved of the dress! I think there’s a big opportunity when it comes to context in online shopping. Context is about showing people how a product would be used in real life. Context is about stepping out of the showroom and into people’s homes and closets. I imagine that the reason why few brands focus on context is that it is really hard. Context demands content. And frankly, I feel like we are still in the early stages of figuring out how people want to consume content online and on the growing number of devices that we have access to. There’s a lot of talk about content today. I’d say it’s partly attributed to the rise in social media and brands realizing they need to have quality content to post (or direct people to) on these sites. The problem that commerce brands face with is that they have yet to figure out how to elegantly integrate content into the overall experience with the brand. Today, most sites that aim to integrate commerce and content end up with what I call the Ikea Warehouse Syndrome. If you’ve ever been to Ikea, you know the feeling of delight when you walk through the showroom and see all the beautifully designed rooms. You see products and think “wow, I never would have though to use that product in that way”. It’s inspirational, influential, and ultimately causes some impulse purchases! The story is so well crafted that you can just see yourself living in that room. But then, you get to the end of the Ikea showroom and you enter … the Ikea warehouse. If you’re like me, this is the point when the fun of Ikea quickly leaves and you remember why you’ve avoided the place for years. It’s amazing how rapidly the inspiration you had to purchase a certain product escapes your mind and is replaced with the frustration of actually finding that product. Then, you grab the cardboard box and remind yourself that you’ll soon have to assemble that product. Imagine if there was no Ikea warehouse. Imagine if instead, you could add items to your cart as you walked through the Ikea showrooms. Imagine that Ikea was just one giant showroom. After spending hours walking the showrooms and shopping as your went, you’d take an obligatory stop for a Swedish snack, arrive at register, pay, and pick up your items on the curb (or have them delivered). If Ikea could eliminate the warehouse, I imagine they’d have a lot more sales (but, possibly not impact revenues as their prices may have to increase to accommodate from the white glove service replacing the DIY warehouse). Most commerce sites today who are attempting to integrate content are much like the Ikea warehouse experience. There’s an area of the site where you shop and then you have the other area of the site where the content is, often called the blog, magazine, or something clever. This results in a constant jumping back and forth between the content section and boring product detail pages that are lifeless and void of the very context that made you click on the link to get to that product detail page. Brands are spending (what I imagine to be) a lot of money producing content. But, I’d love to see the numbers behind the impact that the content has on conversions. Is that content really driving people to purchase? Is it just eye candy or is it truly actionable? I’d guess that unfortunately it’s just a navigation link on the website and not truly integrated into the experience. I’d say we’re very early on in the discussion of the marriage of commerce and content. But, what I do know for sure is that the glue that holds it all together is not just community. There’s no denying the rise in social commerce or social shopping sites. However, we’ll soon reach a point of fatigue. People will soon become tired of just looking at pages and pages of naked products. Eventually, people will want and ultimately need context to help them sift through the overload of products available to them in the online marketplaces and bazaars. 1) Which commerce sites do you think are doing the best job at integrating content? 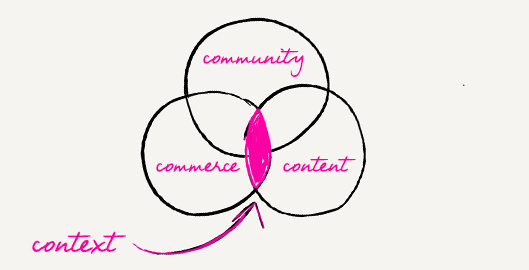 2) Which content sites do you think are doing the best job at integrating commerce? Please leave your answers in the comments. I’m excited to hear your ideas!!! And stay tuned, I’ll definitely be posting more about this topic.